FAO Schwarz is the name of an upscale specialty toy retailer headquartered in New York City. 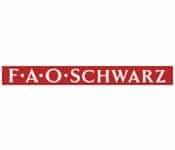 FAO Schwarz was founded in 1862 under the name Toy Bazaar by German immigrant Frederick August Otto Schwarz, in Baltimore, where he and his brothers retailed toys from a fancy-goods store. However, shortly after its business peak in 2000, the company faced financial failure. Vendex put the 42-store chain up for sale. In 2001, The Right Start Company bought 23 of the 42 stores from Vendex. The other nineteen unsold stores were immediately closed. In December 2003, Right Start itself filed for bankruptcy. It would emerge from bankruptcy in April 2004.